CLICK ON COVER TO PURCHASE THROUGH AMAZON. 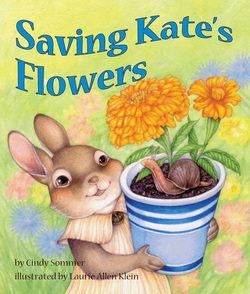 ​Kate wants to save all the flowers from dying before winter. But Kate learns that some flowers will come back in the spring. Those are called perennials. Some don't come back, and those are called annuals. Kate pots up as many annuals as she can, and brings them all inside. She forgets that Dad is allergic. What will Kate do now? Saving Kate's Flowers has won the 2017 Crystal Kite Award from the SCBWI for for the New York region!! !